It is the eve of the FIFA World Cup, the globe’s premier sporting event. The host country is Brazil. A victory for the home team is inextricably linked to the skills of the country’s principal striker, Tico “The Artist” Santos, the greatest player in the history of the sport. All the politicians in Brasilia, from the President of the Republic on down, have their seats squared-away for the finale, when they hope to see Argentina, Brazil’s bitterest rival, humbled by the Brazilian eleven. But then, just three weeks before the first game, Juraci Santos, Tico’s mother, is kidnapped. The star is distraught. The public is appalled. The politicians are outraged. And the pressure is on Chief Inspector Mario Silva to get her back. Suspects aren’t lacking. Among them, are a cabal of Argentineans, suspected of having spirited the lady away to put Tico off his game, the star’s gold-digging, top-model girlfriend, whom his mother dislikes and has been trying to get out of his life, his principal rival, who wants to play in the World Cup in Tico’s place, and the man whose leg Tico broke during a match, thereby destroying his career. In the end, Silva and his crew discover that the solution to the mystery is less complex - but entirely unexpected. This will be the first time that my readers will have seen a police procedural reviewed however after reading A VINE IN THE BLOOD I rather doubt that it will be the last. Luckily it was a quick read, it took me seven hours from start to finish, as I wasn’t able to put the book down until the rather surprising and satisfying conclusion. A VINE IN THE BLOOD has the reader right in the middle of the action from the very first page where the murder of two women was discovered and never gives you a chance to take a break. There is never a dull moment, never a time when the reader is slogging thru waiting to get to another ‘good’ part. The entire book is just that good. The only problem I had with the book is a fault of my own in that I don’t read or speak Portuguese and the book is set in Brazil. Because I couldn’t pronounce the characters’ names I had problems keeping them straight in the beginning. Once I got that squared away in my head it was all smooth sailing. 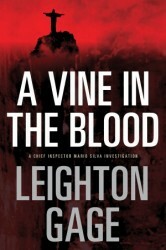 I would recommend A VINE IN THE BLOOD to any readers who enjoy police procedurals and I would rate it a 4.8. **This book was given to me by the author in exchange for an honest review. No money has or will change hands.